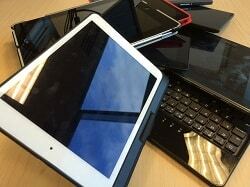 Can a Tablet Boost Your Real Estate Sales? | Fournier Law Firm, Ltd.
Can a Tablet Boost Your Real Estate Sales? If you’ve been looking for a legitimate reason to splurge on an iPad or Surface Pro 3, a new article published by RealtorMag suggests the purchase is less of a luxury than you might think. In fact, for on-the-go real estate agents, a tablet is becoming an essential tool of the trade that more than pays for itself in increased productivity. Whether you use it to pull up detailed property listings for clients on the spot or to help navigate your way to meetings in the field, a tablet is the next best thing to carrying your desktop computer around with you.